For GPS, Use 250 HH Burch or HH Burch in Oak Hill. Riverbreeze Park is a county boat ramp with a playground and restroom facility. If you are staying in New Smyrna Beach and you know how to get going south on US1 towards Edgewater, you shouldn't have any problem finding it. If you need help getting on US1 South, call me or ask at the front desk where you are staying. CLICK HERE to Find Riverbreeze Park on Google Maps. If you are not sure you are on the right track, call me, Angie, at 386-423-3474. I will talk you to the ramp. I would rather lend assistance before you get too far in the wrong direction. If you are travelling a distance to meet at Riverbreeze Park and have web access, try this before you leave. Go to Google Maps and enter your route. Choose Show Traffic, and check for accidents or construction. Go South on US1 - Dixie Freeway Look for the Roberts Road intersection with Publix Grocery and Burger King on Right. Then go 4 miles. You will see an Oak Hill City Limits sign on your right. Just passed the City Limits sign, look for Steve’s Famous Diner and a used car lot on your Left. Get in the Left Lane, Go 200 yards and Turn Left beside the billboard sign that reads Riverwood Park. The street you turn onto is HH Burch. There is one more sign directing you to Turn Left into Riverbreeze Park. The road winds around and you drive passed a Playground and Restroom Area. Turn right and park in the area adjacent to the Playground and Restrooms. If you miss the turn into Riverbreeze Park, the road takes you to Riverwood, the campground area. Just turn around and look for the Riverbreeze Park sign. Go through Edgewater. Turn Right or South at US1 beside Chick Fillet. Look for the Roberts Road intersection with Publix Grocery and Burger King on Right. This is a toll road; have your quarters ready. If you see Steve’s Famous Diner on right, you have just passed it. The street you turn onto is HH Burch. There is one more sign directing you to turn left into Riverbreeze Park. The road winds around and you drive passed a Playground and Restroom Area. Turn right, and park in the area adjacent to the Playground and Restrooms. If you miss the turn into Riverbreeze Park, the road takes you to Riverwood, the campground area. Just turn around and look for the Riverbreeze Park sign. Capt Karty was an excellent guide and worked very hard to find some elusive Redfish. We took home our limit and released some real hawgs while traversing well over 15 miles of the lagoon. 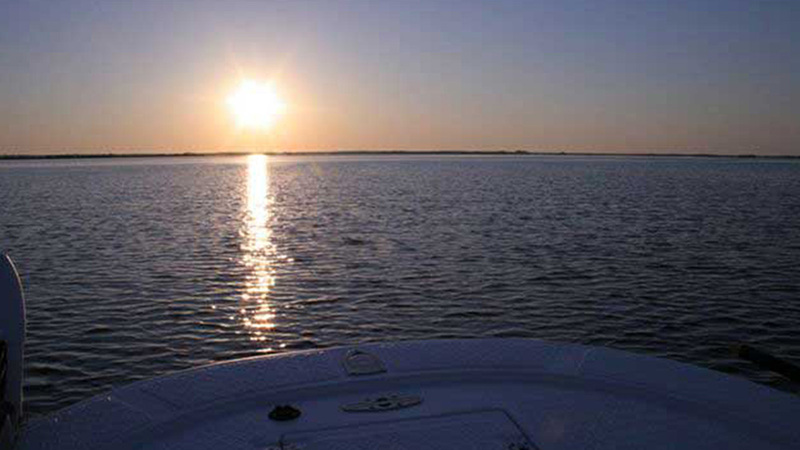 He poled us long distances to provide us with good chances to catch Redfish. Great Boat. Reasonable rates! I fish alot and would put this experience very near the top. Four fishing amateurs had a great day on the boat with Capt. Karty and we caught a lot of different fish: Trout, Redfish and a Snapper. We even had a group of dolphins visiting with us. Capt. Karty is a great guy and is very helpful and supporting. If he can have amateurs like us catch fish, he surely knows what he is doing. Always a good experience. I am an angler of average ability and have fished with Capt. Karty several times over the last few years. 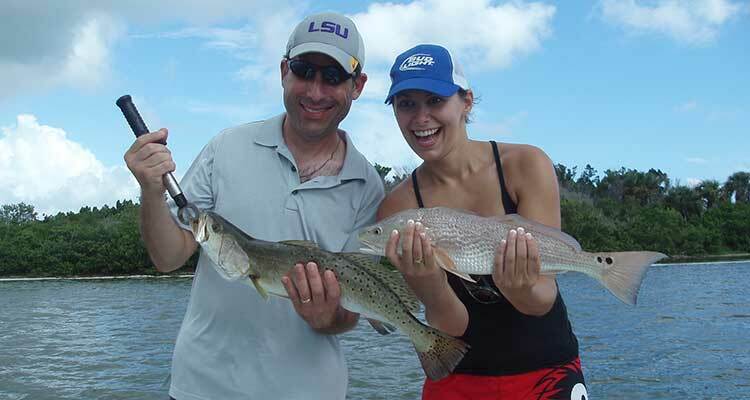 While some trips are more productive than others, I have limited out on trout and/or redfish more often than not. Karty always works hard at finding fish and is patient when my casting skills fall short. I have fished with a number of guides and Capt. Karty is the only one I have booked for repeat trips. Hard working with a pleasant demeanor and most importantly, I always learn something.